Many families suffer from hunger around the world. They should not be suffering from hunger. World hunger should end now! My name is Johnny Jiao and it is in my highest demands that world hunger should come to a stop. 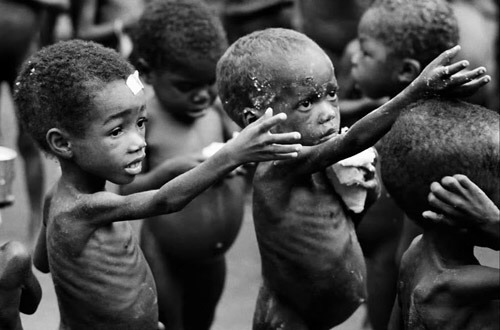 I want to tell you about world hunger and how it is affecting the world currently. World hunger is mainly referred to as under-nutrition. Both malnutrition and under-nutrition refer to the effects on people of not having enough food. Some 795 million people in the world do not have enough food to lead a healthy active life. That's about one in nine people on earth. Asia is the continent with the most hungry people - two thirds of the total. The percentage in southern Asia has fallen in recent years but in western Asia it has increased slightly. It is calculated that US$3.2 billion is needed per year to reach all 66 million hungry school-age children. Bad eating routines causes almost half of deaths in children under the age of five, which is about 3.1 million children each year. Women are the world's primary food producers, yet cultural traditions and social structures often mean women are much more affected by hunger and poverty than men. A mother who is stunted or underweight due to an inadequate diet often give birth to low birth-weight children. Around 60 per- cent of pregnant women in developing countries are iron deficient. Lack of iron means 315,000 women die annually from hemorrhage at childbirth. As a result, women, and in particular expectant and nursing mothers, often need special or increased intake of food. This topic is important to me because when I was younger and lived in China, my family barely had enough food to keep everyone going for the day. However, we kept working hard and finally came to America. Even in the US, we had to keep working hard day and night just to provide my family food for the day. Life was tough and hunger was definitely a big part of that issue. It is because of this reason that I would always help the people in need. I would volunteer and provide the hungry with food they need to go on through the day. The future of the world and its starvation is in your hands, next president. The lives of many children and adults are in your hands. Please help the people that are suffering from starvation and provide them with the necessary needs they need to survive. Thank you for your time. San Marino High School, class of 2017. Prevent illegal immigrants from taking American's jobs. The American education system is killing curiosity in students, therefore dooming the future of innovation. Stand by those whose lives and lands are violated by the Dakota Access Pipeline. About 7.6 million companion animals enter animal shelters in the U.S. every year, and 2.7 million of them are euthanized. My summary is about Immigration life matter because immigration have a family and a life. Global warming is causing lots of problems around the world. If we don’t try to stop it these problems will get bigger. Why world hunger needs to be helped. This letter is about ending food insecurity. How we can end the child hunger epidemic in America.